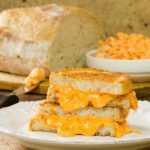 The Grilled Pimento Cheese Sandwich has cheese that oozes out as you slice it in half or take a bite. It is gooey and delicious. Yield varies depending on size of bread and amount of pimento cheese used on each sandwich.